The Ella Standard, (5-Piece) 60 in. x 31 in. Roll in Shower is manufactured using premium marine grade gel coat fibreglass which creates a smooth, beautiful, long lasting surface with anti-slip textured shower base floor. 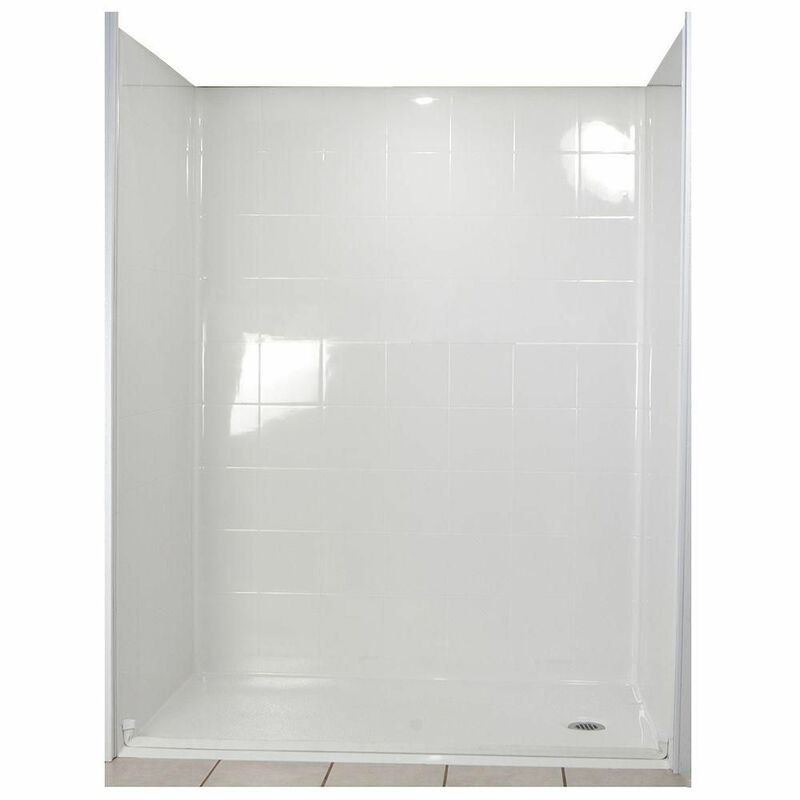 Ella Standard Barrier Free Shower walls are reinforced with plywood and steel providing flexibility for seat and grab bar installation at needed height for any size bather. The integral self-locking aluminum Pin and Slot System allows the shower walls and the pre-leveled shower base to be conveniently installed from the front. Premium quality material, no need for drywall or extra studs for fixture support, 30 Year Limited Lifetime Warranty (on shower panels) and ease of installation make Ella Barrier Free Showers the best option in the industry for your bathtub replacement or modification needs. Made in U.S.A. For more info call 800-480-6850. Standard 31-Inch x 60-Inch x 77 1/2-Inch 5-Piece Barrier Free Roll In Shower Stall in White The Ella Standard, (5-Piece) 60 in. x 31 in. Roll in Shower is manufactured using premium marine grade gel coat fibreglass which creates a smooth, beautiful, long lasting surface with anti-slip textured shower base floor. Ella Standard Barrier Free Shower walls are reinforced with plywood and steel providing flexibility for seat and grab bar installation at needed height for any size bather. The integral self-locking aluminum Pin and Slot System allows the shower walls and the pre-leveled shower base to be conveniently installed from the front. Premium quality material, no need for drywall or extra studs for fixture support, 30 Year Limited Lifetime Warranty (on shower panels) and ease of installation make Ella Barrier Free Showers the best option in the industry for your bathtub replacement or modification needs. Made in U.S.A. For more info call 800-480-6850. Standard 31-Inch x 60-Inch x 77 1/2-Inch 5-Piece Barrier Free Roll In Shower Stall in White is rated 3.0 out of 5 by 1. Rated 3 out of 5 by Maggie from Recent purchase Parts didn't fit together well and my plumber said we should return it. needed it now so had to use extra caulking to seal the seams.